For this project, I decided to depict the shrinking of the summer polar ice cap through the use of a 3D cube paper model. 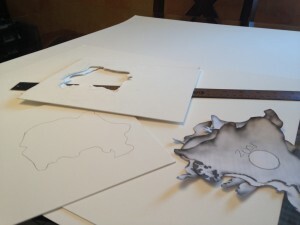 The idea came from Peter Vojtek’s 3D paper model of the shrinking Aral Sea, https://petervojtek.github.io/diy/2015/07/14/aral-sea.html. Data was collected for the years of 1999, 2001, 2002, 2003, 2005, 2008, 2009, 2011 and 2012 from the Earth Observatory website. The data collected was in the form of photographs, and depicts the permanent ice coverage for the corresponding year. Although there is not a drastic difference between each level, it is clear that the permanent ice coverage contracts. The satellite images show that the area of permanent ice coverage in the Arctic during the summer is contracting at a rate of 9% per decade. 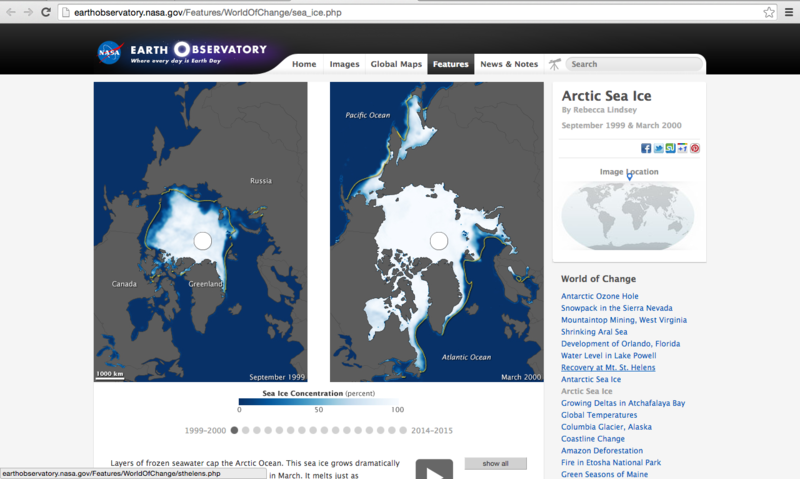 The satellite images were collected from http://earthobservatory.nasa.gov/Features/WorldOfChange/sea_ice.php, as shown in the screen shot below. The model materials – model paper, exacto knife, glue and paint – were retrieved from Michael’s arts and crafts store. Some of the materials used are shown in the following photograph. 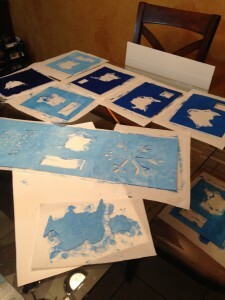 Other materials used were a black and white printer, a ruler and scissors. Each cut out of the ice cap to the corresponding year was prepared by saving the images, printing the images and cutting out the area of permanent ice coverage (as shown in the photograph above – one can see the example shown by the 2008 permanent ice coverage cut out which was currently sitting on top of all the other cut outs in the right hand corner). The model boards were prepared by dividing two 16 by 20 inch sheets into eight cut outs. A larger sheet was then cut into three pieces to prepare the outside part of the cube (these three pieces were connected; slits were cut in the folds of the paper in order to allow the board to bend nicely). 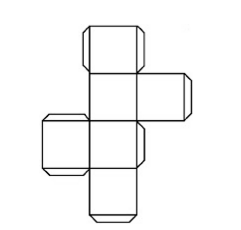 The 3D cube template, shown in the photo below, was the technique that was used to create the model. Once the preparation steps were complete, the model was then ready to make. The next step taken to create the model was tracing each year’s cut out (of the permanent ice coverage) onto the individual model boards (as shown by the second photo). A rectangular section was also cut out for the years to be displayed at each level. This rectangular section became smaller for each layer added (in a descending order), in order to allow the date to be seen at the various levels. Decorating the sides of the cube was the next step in the process. 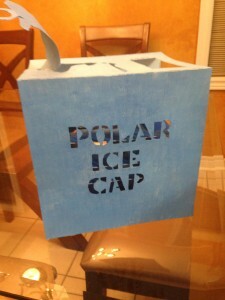 In order to write “Polar Ice Cap” on the front side of the cube, the letter were first hand drawn onto the paper, than carefully cut out using an exacto knife. 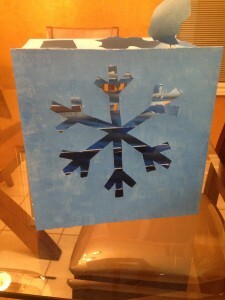 On the backside of the cube, a snowflake was hand drawn and once again cut out using an exacto knife. The front and back sides of the cube are shown in the photos to the left and below. Afte r each layer and the sides of the box were cut out, the boards were then ordered in chronological order. The boards were then painted in various shades of blue, as shown in the photo to the left. 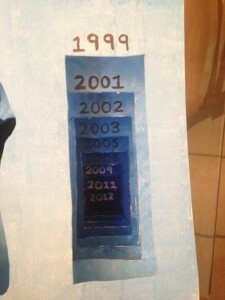 The corresponding year was then written onto the model board with either silver or black permanent marker (whichever color was more visible on the painted board). The final step of the process was gluing all the pieces together. The key to this step was ensuring that each of the layers was put in chronological order, and that each layer was the same distance apart. Ensuring that each layer was the same distance apart (1.25 inches to be exact) allowed the model to accurately depict the shrinking of the ice cap. 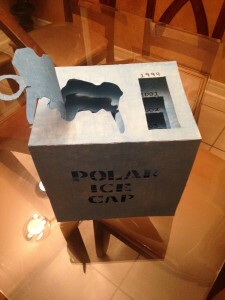 The piece that was cut out from the top layer was then glue to the top, to give the box an “opening” look. 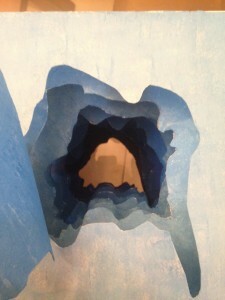 This piece allowed the model to appear as if an individual opened the top layer to look at the depiction of the shrinking polar ice cap through the 3D model, as shown in the photo below. The final dimensions of the 3D Paper model cube project are 8” x 10” x 10”.